Calatrava’s city of arts and sciences seen in Tomorrowland. Santiago Calatrava really wants you to stop blaming him for the very delayed and very over budget World Trade Center Transit Hub. All of your snark and rude comments have really gotten to him, which he recently revealed to the Wall Street Journal. “It has not been easy for me,” he said. “I have been treated like a dog.” But there’s now some good news that should help cheer up the Spanish starchitect: famous person George Clooney is staunchly on his side. 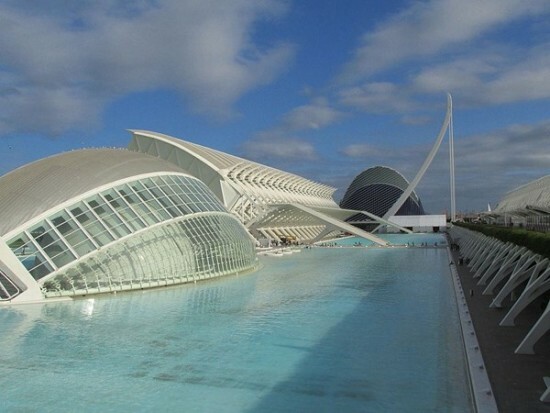 Clooney is in some new movie called Tommorowland that filmed at Calatrava’s City of Arts & Sciences in Valencia, of which he is a big fan. At a recent press conference to promote the film, which took place on the modern campus, Clooney lavished praise on Calatrava. “This is an amazing place,” he said. “If there’s ever a question about whether or not there are dreamers in this world just come to look at this building, it is the most extraordinary place. There is such hope here, it’s really fun to be in a place like this.” The complex is striking, sure, but maybe Clooney hasn’t heard about all the controversy and issues its run into over the years. We’re talking ballooning budgets, crumbling facades, and lawsuits. As Susan Morris recently wrote on the AN Blog, Calatrava’s City of Arts & Sciences is not the only high-profile piece of architecture featured in Tomorrowland. Philip Johnson‘s New York State Pavilion has a cameo too.